All of us have different situations: Some of us have two parent homes, some (like myself) are single, some work outside of the home, and some work inside the home. However, one constant that I’ve seen in most parents who homeschool their children with special needs is that most do not have a lot of time to themselves. 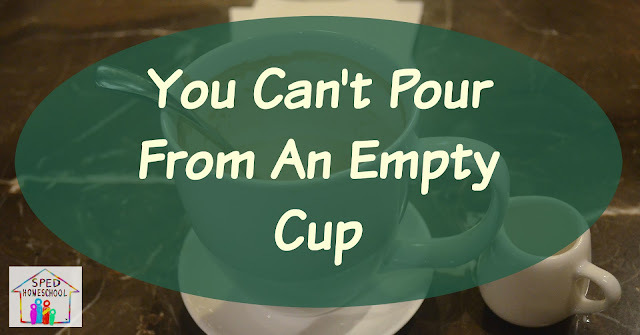 Because of this, our “cups can be empty” before we even realize it. Here are a few of my cup-filling solutions; maybe they will help you too! Even though we get off track during certain times, bedtime routines are essential to my survival. My girls know that they go to bed and mommy gets some much needed time to herself. Yes, sometimes I stay up far too late, but those few hours can energize me to tackle life! Sometimes I do stay up too late, but I also allow myself to get the sleep my body needs. The beauty of homeschooling is that we don’t have to start our days on someone else’s timetable. We have the freedom to begin at a time that works for us and our children. One of my children has gone through countless ear issues and is often up in the night with ear pain. Because we don’t have to be out the door at 6:30 in the morning like some of our public school friends, we can start when she has had an adequate amount of sleep. This makes our days run more smoothly..
Due to some of my kiddos’ issues, we are not currently active in a church. However, I need to fill my spiritual cup as well. I have found podcasts and YouTube to be a wonderful way to listen to Godly content and support from around the world. I listen to Francis Chan, the Bible Project, other homeschooling mamas and uplifting people. I can do this at night when the girls go to bed, or even when I am working on household tasks throughout the day. My kids also enjoy their favorites: Psalty, kids worship songs, hymns, and so much more. We are so blessed to be able to hear content from so many inspirational resources. Personal devotions are also paramount to filling my cup. Even when I get out of the habit, I can always jump back in. At times I’ve found that groups on Facebook such as “Write His Word” are helpful for keeping me on track. They encourage me to journal the Word of God. By writing His word, I remember it! Unlike some other people in my family, I was not blessed with art genes. But I love to create things. I have thoroughly enjoyed the rise of “adult color books”. Coloring is relaxing and somehow it triggers creativity in me. So at night, you will often find me coloring while listening to podcasts. I also enjoy crocheting and I’ve even begun to dabble in painting and drawing. While none of my creations will be in an art museum anytime in the near future, they make me happy and bring peace. These are just a few of the things I do to refill my cup. What do you do? I would love to hear your suggestions! Great article! I hit a brick wall about a year ago and someone suggested a women's Bible study. The problem was no one had one that worked for me. I started a once a month group during an odd time when my husband could watch my son. There is just 5 of us who meet and it is the best thing in the world! For an hour a month I can just relax with other Godly ladies and talk, laugh, and cry. It is like a drug. It helps me so much. I love your suggestions too! I am so glad you took the initiative to start your own Bible study. I'm sure that is such a blessing to all of you. Glad that you found the suggestions helpful. I pray that it is a great year for you and your family.